All the best places in town are already booked for Valentine's Day, huh? Well, there's still one place very close by that you may not have considered: your home! All the best places in town are already booked for Valentine's Day, huh? Well, there's still one place very close by that you may not have considered: your home! Stay in and deck out your abode with these sweet and simple DIY projects. Invite your long-time honey or new-found flame, toss in an old-fashioned card game and a tray of cupcakes, and voilà! You'll be set for an evening that will make 'em fall in a whole new way. Inspired by ModCloth's Sweetheart Shop. See the step-by-step slideshow tutorial below. 1. 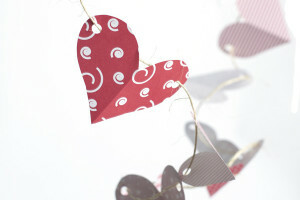 Cut out a handful of tissue paper hearts in various sizes. To get the most out of each cutting, fold the paper like an accordion. 2. Make sure your jars are clean and dry. I used 8-ounce glass jars with a faceted diamond surface, which works lovely with flickering candlelight. 3. Drop a dollop of glue into a paper cup. Mix a little water with the glue to achieve a milky consistency. Apply a thin coating of the glue mixture to jar with your paint brush. 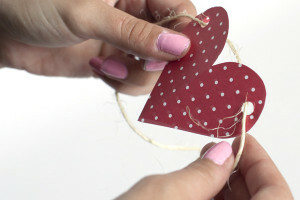 Then, carefully apply tissue paper hearts, overlapping and layering to create a unique affect. 4. Add a final, thin coat of glue mix over jar surface, being careful not to tear the tissue paper. Allow to dry. Drop a tea light into each jar and light with a long kitchen lighter. 5. Dim the lights and set in an area where you and your date will do a lot of relaxin' and romancin'. The warm, glimmering light really sets the mood! 1. 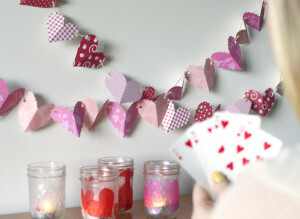 Cut out 20 heart shapes from paper. 2. Clip hole punches on either side of each heart. 3. Cut about 2.5 yards of twine. 4. Weave the twine through the holes of the hearts, leaving long, curly strands of twine at each end for a nice draping effect. 5. Hang in a place in your home that needs a little love! - Find a perf' outfit, or garner ideas for one from ModCloth's Sweetheart Shop.